Hey guys I'm selling a DHM GEN 2 2860 kit. It includes a turbo smart bov, tial EWG (open screamer pipe) and a koozy spec oil drain and manifold heat shield. This kit is on great shape but has been used for 10k miles and shows some wear. The turbo itself has 10k on it and the kit over all has 20k. This kit also has a 3 inch catless down pipe with 3 inch flange for a true 3 inch exhaust as well. 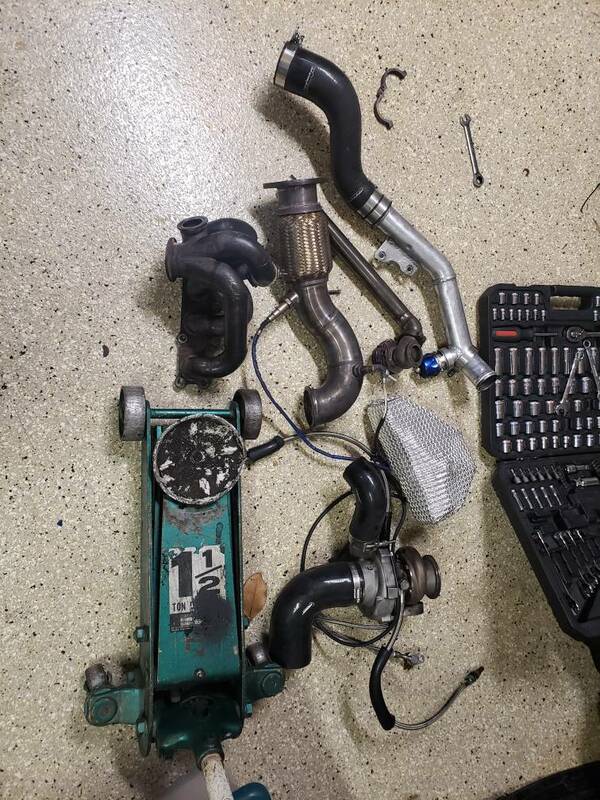 The turbo has zero shaft play and this kit is ready to bolt on and make power. I want 3k +shipping for the kit. Dont low ball me. I paid over 7k for this set up when it was new. Mods I will post more pics later. 2015 Perf blue ST1: Current mods: Cobb; APV3, and rmm, Mishimoto;Catch Can, Oil cooler, and radiator, Bilstien Coilovers, Turbosmart BOV, Tial MVS EWG, Deadhook: symposer delete, Head studs, Gen 2 360R turbo kit, and race intercooler kit, CPE Intake, Custom 3 inch exhaust, Stratified Port Aux Fuel , TTR Mounts, 15x8 Team Dynamics Pro Race 1.2 Wheels, 225/45R15 Toyo R1R tires, TB K-member, chassis and Trans tunnel braces, Pierce 4pt brace, Euro Headlights, Mountune;splitter, Brake lines, Race engine internal kit and oil control, Fiesta RS Spoiler, Recaro Interior swap and much more I'm probaby forgetting.